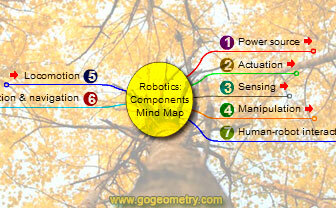 Robotics: Components, Mind Map. Elearning. Robotics: Components, Interactive Mind Map based on Wikipedia: Robotics. This mind map is for educational purpose. Robotics incorporates aspects of many disciplines including electronics, engineering, mechanics, software and arts. Control of robots relies on many areas of robotics. The components of robotics are: Power source, Actuation, Sensing, Manipulation, Locomotion, Environmental interaction and navigation, and Human-robot interaction.